We offer a large variety of Dust Filter Bags that are fabriacted by using woven and non-woven fabrics, for high performance and strength. Fabric quality varies as per the requirement and safety. It can be plain, acrylic coated, flame retardant, spark resistant, anti-acid, anti-adhesive or glazed. Our vast experience in the line of filtration has made us capable of producing Dust Filter Bags, for all types of Bag Houses such as Reverse air, Pulse Jet and Mechanical Shaker. 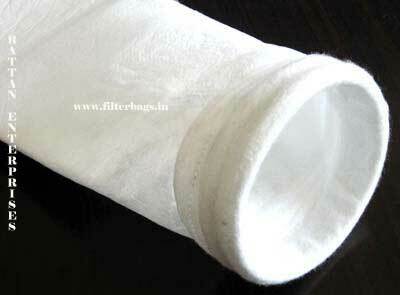 We manufacture different types of Dust Filter Bags on imported sophisticated machines. Dust Filter Bags are sewn after accurately cut fabric with thermo cutters and using high temperature resistant thread, which gives very strong and leak proof durable seam. We have professionally and technically trained staff, capable of offering virtually any style, configuration, size to meet parameters of exact specification and application requirement.